For Amy’s bridal shower, I created a table runner from old romance novels. Below, i’ll walk you through the steps to create your own for any event. 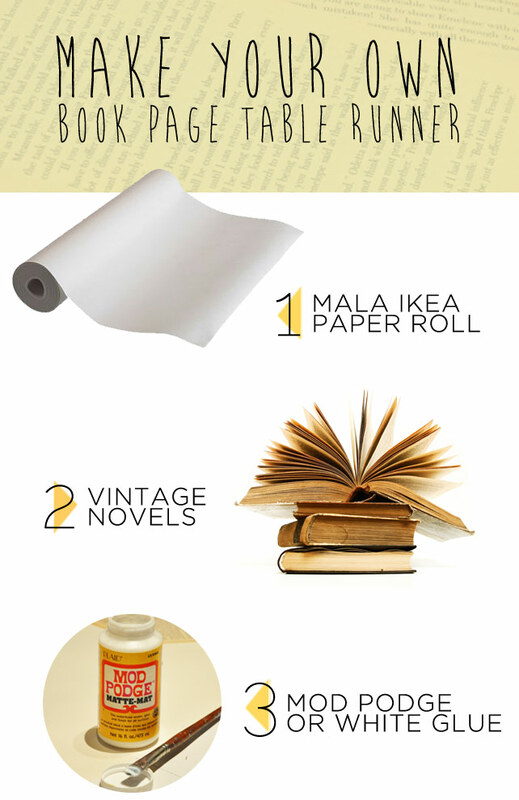 Roll out your ikea paper to the length you want your table runner to be. This will be the base of your project. I found it easier to have something to glue the pages to instead of trying to glue the pages to themselves. You’re then going to carefully remove the pages from your books and lay them onto the paper glueing as you go. They don’t need much glue, you can go back after and glue down the areas that stick out. It’s pretty straight forward. It really looks best if you find a book that has pages that are more of an older yellow tone, it gives more of a vintage vibe. For my friends bridal shower, I wanted to create a simple and useable party favour. I purchased some tiny glass bottles from Michaels and filled them with Japanese Roasted Rice Tea. Then I designed and printed small labels to hang on the bottles with string from the dollar store. The photos explain it further. This past Christmas I made a gift for a friend, knowing that she liked to play Scrabble. I couldn’t afford to buy fancy presents this year, so a craft project was a fun solution. Unfortunately I don’t have step by step photos for this project, so hopefully my instructions are good enough. It’s really more about the idea, you could use just about any materials as a backing and use wood glue to set the tiles in place. Here’s what the final product look like, 4 in total, each one has a hidden word. 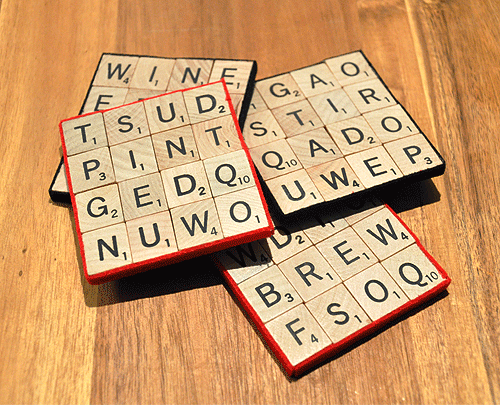 I used words that relate to drinking, “stir, pint, wine, brew.” I wanted to have 4 words in each coaster, but unfortunately it was tough finding enough letters to make lots of words. 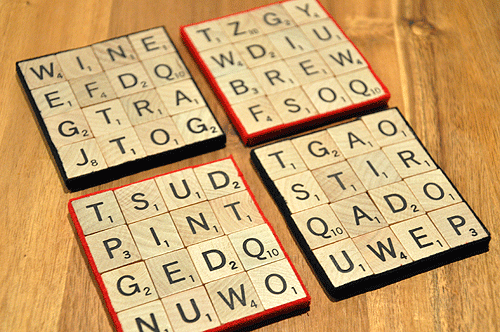 The Scrabble tiles can be purchased online, but I found mine at a local craft store. First layout the letters how you’d like them for the coaster. Then, peel off the adhesive backing and lay your tiles as tight together as you can onto the sticky side of your felt. Use your utility knife to trim off extra felt around the edges. They can be done at this step, but I decided to trim my edges with thin pieces of felt. Adhesive felt is very forgiving, just make sure you buy the super thick type so your coasters won’t be floppy.